Wanna know the best way to start your week? MONSTER SQUAD REFERENCES! 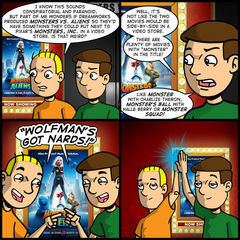 Speaking of monsters, I saw Monsters vs. Aliens this weekend and, unfortunately, was NOT bowled over. I’m not exactly sure what went wrong other than it fell into that same trap of pop culture references and soullessness that other Dreamworks animated movies seem to fall into. Maybe I went in with my expectations too high after the success of Kung-Fu Panda last year. But Monsters vs. Aliens is just more of the same. There are a few laughs to be had. Great line delivery from Stephen Colbert as The President and Will Arnett as The Missing Link. But, unbelievably, it’s Seth Rogen who steals the show as the indestructible blob, B.O.B. Much like B.O.B., Rogen has crafted an indestructible slacker/stoner/moron persona that brings the biggest laughs in this film. He’s pretty much the only character having a good time while the rest of the world is falling down around him and his cluelessness and confusion makes him instantly endearing. The rest of the movie is a cheap girl-power parable wrapped up in a few action pieces that have been strung together. Pretty much the best thing it had going for it was the 3D. But even that was a little annoying when they were pulling cheap moves like a guy hitting a paddle-ball toward the screen. Really, Dreamworks? Why not shoot a scene at a kids birthday party so someone can blow a party noisemaker that uncurls into in our faces. Should you see Monsters vs. Aliens. If you’re a fan of animation, 3D movies and cheesy sci-fi from the 50’s and 60’s, I’d say “yes.” If you’re a fan of laughing or have laundry to fold, I’d say “no.” I don’t really regret going. But it could have been executed much better. Switching topics, I wanted to let everyone know that I will be at the Emerald City Comicon in Seattle this Saturday and Sunday, April 4 – 5. I’m going to have a table on Artist Alley and you can find me at H-05. I’m a little nervous about going because this will be the first convention I’ve flown out of state to attend. Typically I only go to conventions I can drive to so I can save on cost. But I found a cheap flight to Seattle and Emerald City was too good to pass up (they have an excellent reputation and are very welcoming to web comics). Part of my nervousness stems from not knowing anyone at the convention. Sure, there will be a lot of web comics people there like Scott Kurtz, Jeph Jacques and the guys from Penny Arcade. But these guys operate WAY out of my league and they aren’t people I’ve really had an opportunity to interact with socially before. When I go to Wizard World Chicago ever year, I get to hang out with Gordon McAlpin, Joe Dunn and the rest of the Digital Pimp crew. We set up shop next to each other and goof off for 8 hours while we try to sell our wares. In Seattle, I’ll kind of be own my own. Well, that’s not entirely true. To take the sting out of travel expenses, I’m splitting a room with Indigo Kelleigh from The Adventures of Ellie Connelly. So at least there is someone I can hang out with after being on the show floor all day. Or, if he has better places to be, I could always go see Fast and Furious the weekend. Oh! I should probably mention that I was invited to speak on a panel at the convention! Yeah – it’s the Business of Webcomics panel at 1:00 PM, Sunday, April 5 in panel room 3AB. I’ll be in a room, talkin’ web comics with Robert Khoo from Penny Arcade, Danielle Corsetto from Girls With Slingshots and Jeph Jacques from Questionable Content, doing my best not to sound like an idiot. It’s an amazing opportunity and I want to say thanks to the show organizers for including me! If you’re coming to the show that day, check it out! Is anyone reading this planning on going to the convention this weekend? If so, can you talk about it a little bit in the comments section? I just want to get a general sense of what to expect. I’m sure everything will be fine, it’s just the unknown that’s eating at me a little bit. If nothing else, it’ll be a real treat to meet fans from the West coast. This will be my first trip to your neck in the woods and I’m eager to meet you!